Mozart's famous Requiem is well known. A lot of background information is available on the internet, for example, http://www.carringbush.net/~pml/music/mozart/requiem/mozart.html. It was believed for a very long time that Mozart composed the Requiem as a presentiment of his own death, although there is no evidence of this, nor did Mozart make any suggestions of the kind. Mozart set down the above thoughts about death (in his letter to his father) more than four years before his own decease. "As death, when we come to consider it closely, is the true goal of our existence, I have formed during the last few years such close relations with this best and truest friend of mankind, that his image is not only no longer terrifying me, but is indeed very soothing and consoling! And I thank my God for graciously granting me the opportunity (you know what I mean) of learning that death is the key which unlocks the door to our true happiness. I never lie down at night without reflecting - young as I am - I may not live to see another day. Yet no one of all my aquaintances could say that in company I am morose ordisgruntled. For this blessing I daily thank my Creator and wish with all my heart that each one of my fellow-creatures could enjoy it." 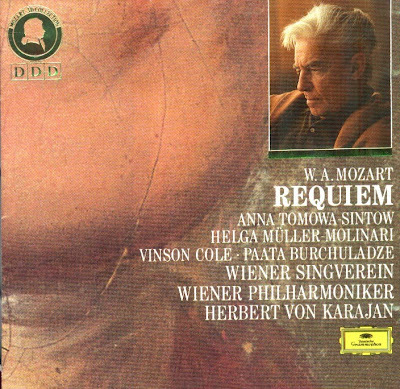 The CD was released by Deutsche Grammophon, 1987, (DDD). 431288-2 G MD. This consummate performance on CD leaves nothing to be desired !